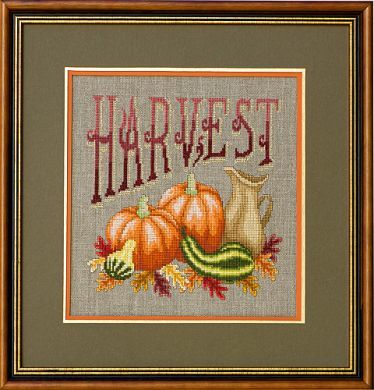 “Harvest” stitched in floss and Kreinik metallic gold braid. Fabric: Stitched on 28 count Natural Linen (76B) by Wichelt Imports, Inc., available from your local independent needlework shop. Materials Summary: Uses a total of 34 Anchor/DMC colors and 1 color of Kreinik braid.